Ever look at a really cool effect in your favorite game and wonder, "How in the world did they do that?" This book teaches you the skills that you need to create effects that are just as awesome as the ones that first amazed you. New to DirectX? Don't worry! There are plenty of tips that will bring you up to speed quickly. Already an experienced programmer? Get ready to creat some amazing effects that will get people hooked on your game! An entire section on 2D special effects shows you how to use your 3D card for effects like transitions and image warping. If it's 3D effects that you're after, this book has everything that you need to create cool effects like explosions, water, and magic spells. 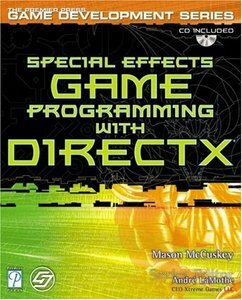 Special Effects Game Programming with DirectX is the next step in transforming your game from an application to an experience.